Gotti is an attempt to tell the man’s story from his early days in the mafia through his dying days in prison. It makes him out to be a hero in the community while someone who was feared and revered within the organization. The Dapper Don/The Teflon Don that is what the media dubbed him. Mafia Boss is what authorities called him. To some, he was a criminal to others he was a savior who kept their streets clean from drugs and violence. I ironically he rose through the ranks of the mafia by committing heinous criminal acts including murder. whoever he was he was infamous and a character who for years evaded the law. Unfortunately, it was his own underlying who eventually created his downfall that got him arrested and sentenced to jail for the rest of his life. He was ruthless and fearless and he became the head of the five biggest Mafia crime families in New York. His name was John Gotti (John Travolta; Pulp Fiction). Gotti grew up in the Bronx and dropped out of high school at 16 already entrenched in the Gambino crime family. He moved up through the ranks with a reputation for having a violent temper. When his mentor, Aniello "Neil" Della Croce (Stacy Keach; Escape from L.A.) died Gotti made the bold move to go after mob boss Paul Castellano (Donald John Volpenhein; The Killing Point) killing him and his underboss outside Spark's steakhouse. This cemented Gotti's ascension to the head of the Gambino Crime Family. The film Gotti not only delves into these criminal activities but into the personal life of John Otto and his family. He married Victoria (Kelly Preston; What a Girl Wants) in 1962 and they had five children. Their second son, Frank, was accidentally killed by a neighbor in 1980. John Jr. (Spencer Rocco Lofranco; At Middleton) initially joined his father's crime organization but tried to "go straight" after getting married, having children and getting arrested. He eventually gave up organized crime after his father died in 2002. The film Gotti is an attempt to tell the man's story from his early days in the mafia through his dying days in prison. It makes him out to be a hero in the community while someone who was feared and revered within the organization. Unfortunately for Director Kevin Connolly (Entourage), there is so much material that it overwhelms. There are too many players, too many pivotal moments in Gotti's life to condense it down to an hour and forty minute movie. Writers Leo Rossi (Mafioso: The Father; The Son) and Lem Dobbs (Dark City) also softball the story making Gotti out to be much nicer than I suspect he actually was in real life based on stories told about him. Travolta might seem like the perfect person to play Gotti given his heritage and his early acting jobs as a streetwise Italian kid in New York City. However, he is so distinctive that we can never get passed Travolta to see the Gotti he is trying to portray. His real-life wife Preston plays Victoria as somewhat demure and quiet which doesn't seem likely as the real-life bride. She comes across as whiny and almost needy. Keach has a smaller role but seems to be underutilized, again perhaps because of time constraints. The standout amongst this group is definitely up and coming actor Lofranco. His portrayal of a tortured and torn dutiful son is strong and he holds his own in all of his scenes. The Blu-ray is offered in 1080p high definition video quality which offers a sharp contrast between the film and the real footage intercut in the film. The picture, for the most part, is sharp and clean. The DTS-HD Master Audio 5.1 is clear and multilayered as the viewer can hear the gunshots coming from all sides while the dialogue is relegated to the center channel. Besides the Digital HD, the Blu-ray offers no extras whatsoever which is a little disheartening. The story of John Gotti needs to be longer with a flow chart included to keep track of all the mafia guys and their nicknames. This film unfortunately only scratched the surface and leaves the noosing underbelly of the man unexplored which probably would have made for a much more interesting, dramatic and fictitious movie. 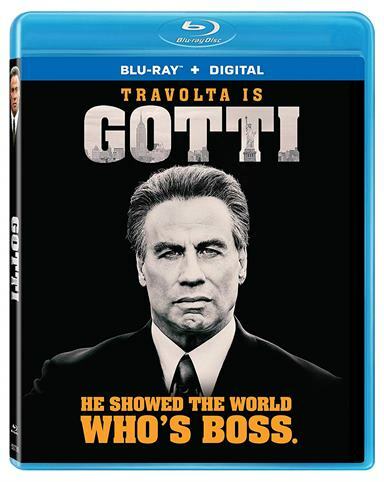 Download Gotti from the iTunes Store in Digial HD. For more information about Gotti visit the FlickDirect Movie Database.